Starting off with the pieces that our editors wrote, Elicia Wickstead tells us about that critical moment when it became clear to her that she was a theatre nerd and had found a home among improvisers; Joel Dale talks about how being late to an improv audition may have been the first big step in his improv journey; Dave Clapper writes about how his love of group-generated art brought him back to the improv folds not long ago after a long hiatus; Next, we get a quick trip through the improv life and times of Phill Arensberg, coming to a head at the thoughts he has been having most recently about improv; I’m next on the list, with a brief history of Ian, focusing on the improv-y bits; and rounding out our merry band is Andrew McMasters, who tells us a little about his love affair with the audience and how he stays so darn upbeat all the time. 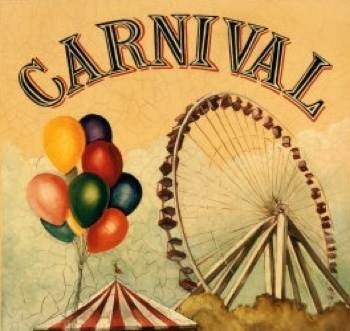 Of course, the carnival is not all about the editors, and this time we got two submissions from the readers as well! First off we have Holden, who gives us a short piece on the somewhat therapeutic role improv has played in his life. Secondly, we have Douglas Willot, who tells us about young him, whose brain was altered by improv and started turning him into the well-oiled improvisational man/machine he is today. There, that about does it for our inaugural carnival. I’m very happy to see all the responses we have gotten so far. So I command you: go, read, comment if you are inspired to, lurk if you are not. We’ll see if we can’t get another carnival up and off the ground next week. I’m optimistic. This entry was posted in Carnival of Improv Blogging by ischempp. Bookmark the permalink.